Psilocybe Cubensis Colombian is known for its strong effects but it also is a great variety for the novice psychonaut because only very few reported feelings of anxiety when tripping on this strain (hey, it can happen!). The effect of the Colombian is a very social feeling and it is not so heavy on visuals. 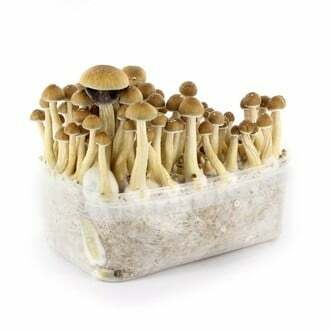 Psilocybe Cubensis Colombian is not only known for strong effects but it also qualifies as the perfect choice for the novice psychonaut because only very few users reported feelings of anxiety after consumption of this variety - hey, you know the risk of a bad trip is always on board, don't you? The trip has a very social facet and is not so strong regarding visuals, making it easier for the novice psychonaut to focus on the desirable mental effects of the magic mushroom trip. This 100% mycelium kit contains 1200ml of 100% spore-inoculated substrate and is ready to grow right after receipt. Now all you have to do is add a little patience and effort - in form of waiting for the fruits to show up and grow while you spray the inside of the grow-bag every day. Happy tripping!